Prepare these crispy yet tender crab cakes in just 25 minutes. Hellmann's® Real Mayonnaise makes the perfect base for the dip. 1 Combine red chili sauce, Hellmann's® Real Mayonnaise, soy sauce, lime juice and water in small bowl. Stir in cilantro; set aside. 2 Combine bread crumbs, eggs, parsley, green onions, lime peel, ginger and chili pepper in medium bowl; gently stir in crabmeat. Shape into 8 patties, then dust lightly with flour. 3 Heat olive oil in large nonstick skillet and cook crab cakes over medium heat, turning once, until done, about 10 minutes. 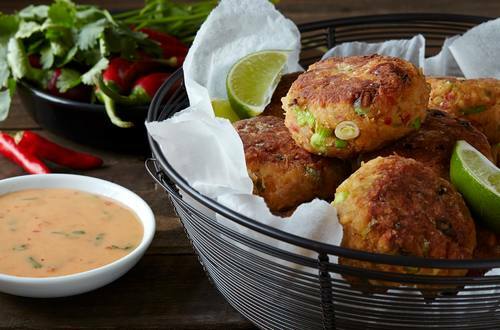 Serve crab cakes with cilantro dipping sauce.